What can Ohio’s failed high-speed rail program teach us about America’s standing in the world? When Governor John Kasich (R) gave away $400 million intended to start passenger rail service along what is known as the 3C Corridor, it spelled the end of Ohio’s high-speed rail aspirations for the foreseeable future. While those aspirations were well intentioned, they were also quite modest. Initial service would have had trains traveling at top speeds of 79 miles-per-hour between Cincinnati, Columbus and Cleveland. In an effort to keep upfront capital costs low, simple stations were also proposed along the corridor’s length. In a city like Cincinnati, which boasts one of the grandest passenger rail stations in the United States, the 3C Corridor proposal left Union Terminal off the map in order to avoid the costly approach into the station through the congested Queensgate rail yard. 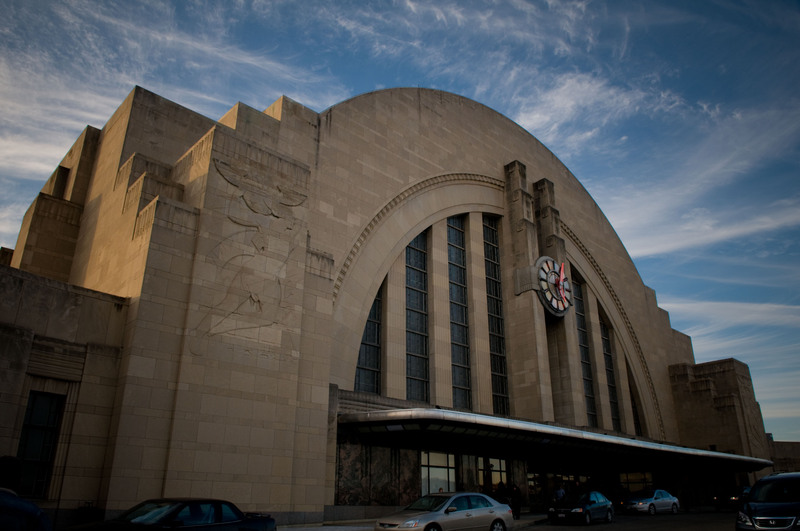 Cincinnati’s famous Union Terminal serves light Amtrak service and museum-goers today. Photograph by Jake Mecklenborg for UrbanCincy. America used to build big things. Ohio used to build big things. This, it appears, is no longer the case, and it makes one wonder if the United States is even capable of building inspirational and useful structures like the Miami and Erie Canal, Union Terminal, or Interstate Highway System again. The fall from grace may not be as noticeable if it were not for the exact opposite trends playing out across Asia, where the economic scale is tipping. 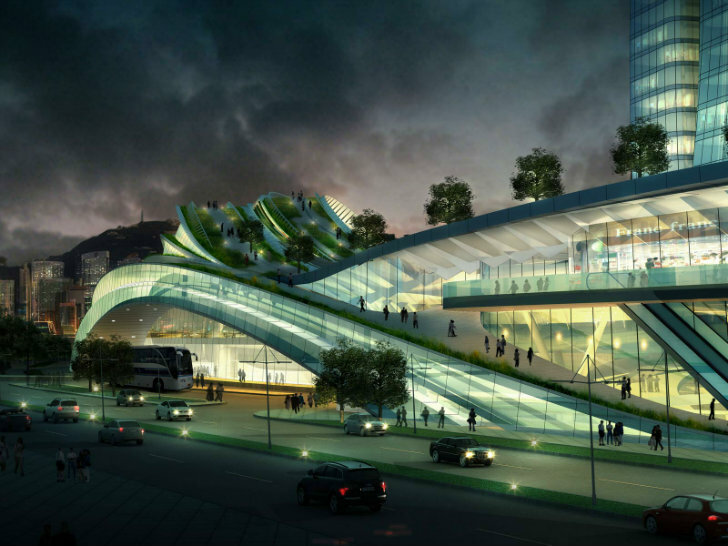 Hong Kong’s $1.3 billion West Kowloon Terminus Station will serve as a dramatic entryway into the global city from mainland China. Renderings provided by Aedas. In contrast to the modest, and failed, 3C Corridor, leaders in Hong Kong will soon realize an extension of China’s high-speed rail network into the heart of their city. A 16-mile link will be built from Hong Kong’s Kowloon district to the region’s border with Shenzhen. Most notable is that the entire 16-mile, $8.6 billion stretch will be underground and terminate in what will become the world’s largest underground high-speed rail station. It is a critical link that will open up those on the mainland to Hong Kong via the entire 87-mile-long Guangzhou-Shenzhen-Hong Kong Express Link. 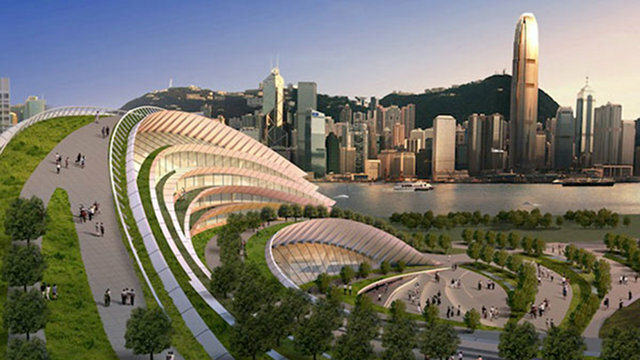 Passengers arriving in Hong Kong will not only be treated to a center city arrival at 124 miles-per-hour, but also an arrival to a truly inspirational structure meant to not only provide a critical service, but awe those exposed to it. The investments will halve the amount of time it takes to travel between Hong Kong and Guangzhou, and will be completed in 2015. America has also been an inspirational place for people around the world, and America has always built and done things that inspire us all. It appears that current policy makers may be content with resting on those past successes instead of investing in the country’s future, and ushering the United States into another generation of global leadership.